What was originally planned to be a "spiritual" successor to System Shock 2, became a beautiful Art Deco shoot-em-up with some RPG like elements thrown in for spice. You start out BioShock as the sole survivor of a plane crash in the ocean. Swimming away from the twisted burning wreckage you discover the entrance to the underwater city of Rapture. Taking a auto controlled sub from the entrance you learn that Rapture was created by some of the greatest minds to escape the governmental regimes of the day. Quickly you discover that things went horribly wrong with this Utopian society. 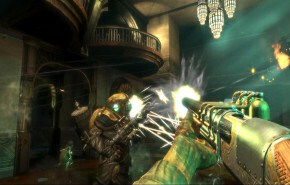 The people of Rapture have been manipulating their genetic structure to add super human abilities. This caused some to go mad with power and cause a civil war that killed most of the city. The survivors are now no longer fully human anymore. Their minds wasted away. You must use anything in the game you can find to survive. Including using the same gene altering plasmids that caused the downfall of Rapture. This is quite simply a game that must be played. Every moment of it is a unique experience. The levels never cease to remind you of your underwater city local. This city is falling apart, and water is leaking everywhere. The game engine creates absolutely gorgeous water effects. Waterfalls, water rushing down hallways, windows viewing out into the ocean, are all rendered masterfully. The only place the game falls down in my opinion is the lackluster ending. There are multiple endings, two to be exact. Neither of them left me as excited as the rest of the game.